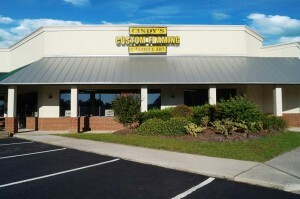 We are Cindy’s Custom Framing & Antique Art. And we specialize in custom frames–specifically providing custom picture frames and custom-built shadow boxes in addition to the standard picture frame designs listed on this site. We have operated a successful retail picture frame shop in Richmond Hill, GA since 2006. 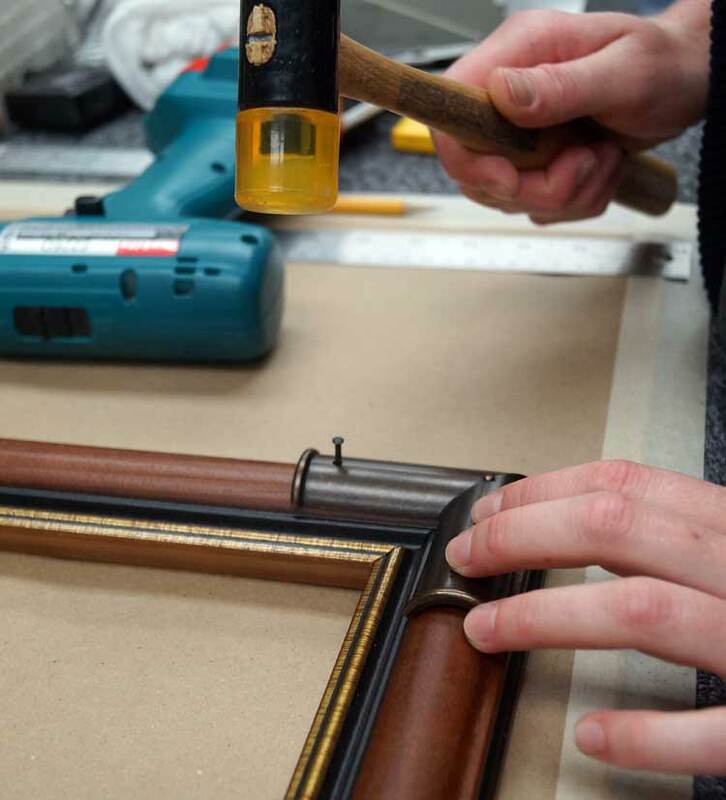 At the heart of our picture framing success are three key elements: Our commitment to high-quality picture framing, and our policy of only using conservation framing materials and techniques. These elements separate us in many ways from our competition as we have illustrated in our Pricing Policy page. A large segment of our custom frame shop business focuses on designing custom frames and custom shadow boxes for military customers. The e-commerce store was initiated as an added service to our civilian and military custom picture framing customers. 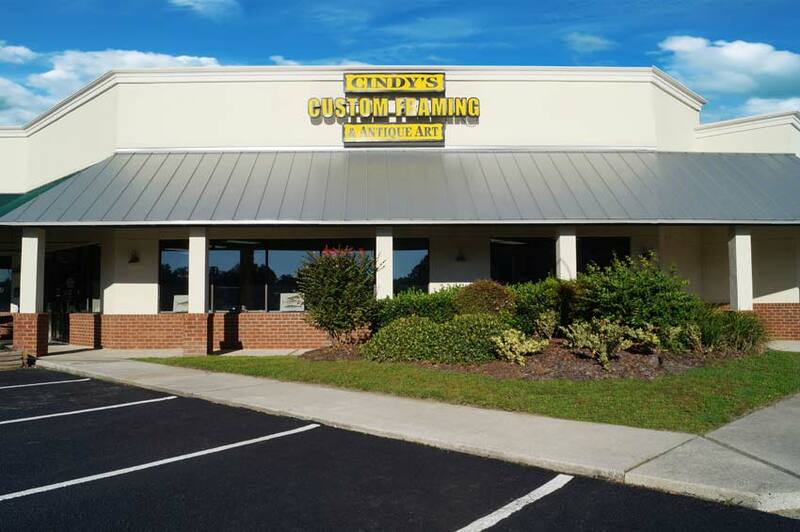 Offering pre-configured guidon framing options is an expedient way to offer guidon framing services without the need to physically visit our shop. The products offered in the e-commerce store evolved from requests from our military customers purchasing framed guidons. Simply put, the guidon options and designs available in the e-commerce store offer our online customers a simplified way to purchase framed guidons. The designs in our online store historically represent the most frequently requested guidon framing options by our military customers. Looking for a custom picture frame? We admit the simplified selections of framed guidons in our online catalog do not fulfill the design requirements for every customer. The standard guidon design packages sold on this site are not a perfect “fit” for every guidon or shadow box customer. Many of our military framing customers request that we place additional objects inside custom frames, flag displays, and shadow boxes. Typically, customers want additional combinations of photographs, distinctive unit insignias, medals, badges, coins, awards, diplomas, and certificates added to their custom shadow box or guidon frame. In addition, they often request military memorabilia that includes combat spurs, knives, and deployment mementos to be incorporated into the custom framing design with other items. What is a custom picture frame? 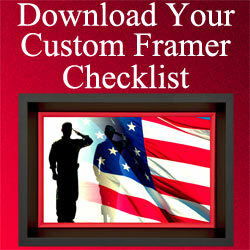 Defining custom framing is simple: Provide a unique design that is made-to-order for a specific customer. Quality custom picture framing includes conceiving an aesthetic design that fulfills the customer’s vision for artfully and tastefully displaying their art or memorabilia. Then custom framing involves mat cutting, frame construction, glass or acrylic cutting, placement of objects, and finally the assembly of all the components utilizing conservation framing materials and techniques. 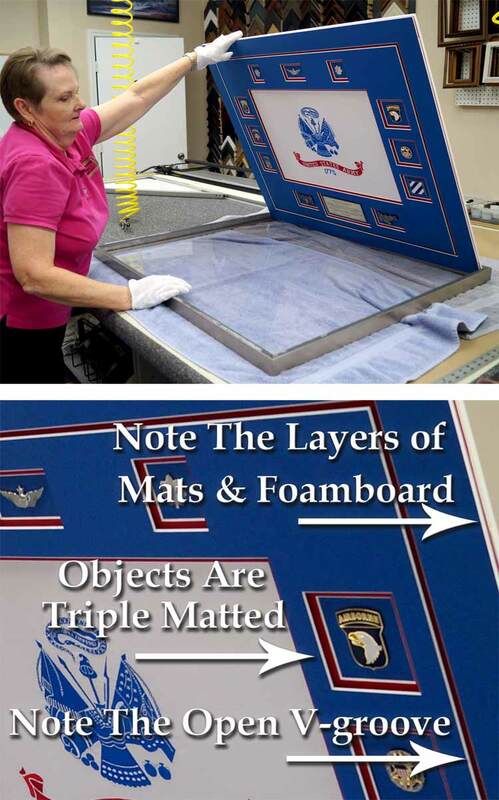 Custom Frames are assembled after a thorough inspection—Close up illustrates the design elements of triple mats, an open V-groove, and the depth provided to objects by layers of mats and foamboard. Quality custom framing differs dramatically from putting something inside a standard size drab colored, off-the-shelf big-box retail store frame. There is an old adage that states: “You get what you pay for.” Our customers recognize the value associated with the high quality of our custom work. These customers are willing to pay a premium for custom picture framing and shadow boxes that artfully showcase and preserve their objects, guidons, flags, medals, diplomas, and other military memorabilia. 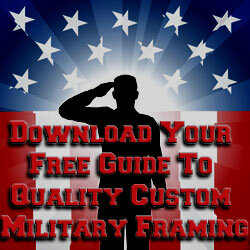 The issue of price versus quality is addressed on our page titled “Defining Framed Guidon Quality and Design.” For this reason, the high quality, self-imposed framing standards, and conservation framing techniques we employ have gained us a wide custom framing customer base. The framed awards, certificates, and diplomas that we frame range in complexity from a simple framed diploma to a shadow box with objects surrounding the diploma or certificate. Please click here to learn more about the custom framing we perform for awards, certificates, and diplomas. Custom framed battalion colors offer incredible framing options. One of the most popular framing options for Battalion colors involves placing the Battalion colors in the center of the frame. It is surrounded by miniature guidons from different units. In addition, coins and a nameplate commemorating an event are placed beneath the guidon colors. We stock and frame a number of original antique cigar labels with military themes. Framed cigar labels are prized by commanders and collectors. Many of the cigar labels we frame were presented as gifts. Cigar labels can be framed with simple frames, or they can be ornately framed using gold-toned frames with gold-toned fillets and acid-free suede mats. We have a large selection of military theme-related cigar labels listed on our sister site Cindy’s Custom Framing & Antique Art. We frame flags in both custom shadow boxes and in flag display cases. We also offer acrylic display cases for large objects and weapons. 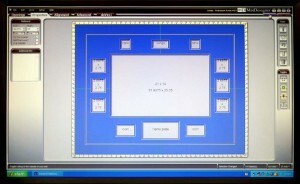 Please follow this link to see examples of custom flag display cases we have designed and built. The examples of flag display cases in this section only represent a small selection of custom framing options available for display cases. The e-commerce store offers a number of framing options for our standard guidon designs. The custom guidon section includes guidons framed with a number of military objects, photographs, medals, and other memorabilia. Click here to see examples of custom framed guidons. We frame military prints and photos using a number of framing style options. These options include our most popular frames and mat combinations with coins, photos, and military memorabilia. Limited edition military art prints are also framed by placing designated unit insignia, patches, coins, nameplates and mementos beneath the print. For more information on framed military prints and photos please click here. Looking for military shadow box ideas? Framing military shadow boxes make up a large part of our custom framing business. Custom military shadow boxes and display cases encompass a wide variety of subject material and objects. For more information about how we custom frame military shadow boxes, please to go our military shadow box framing page. Our experience as custom picture framers is represented by the expanded list of projects we have framed. Below is a summary of military framing projects we have completed with custom frames. Black Picture Frames: we stock a number black picture frame profiles that are suitable for rush military framing orders. Got a rush military picture frame order? Contact us about local pickup. Frames Online: see our e-commerce store and examples of our completed projects; we offer custom framing through our frame shop. However, we will gladly custom frame orders generated from inquiries on our website. Contact us for more at 912-756-2781 or sales@framedguidons.com for details. Large Shadow Box: we have framed some large sports memorabilia pieces, uniform jackets, coats, shirts, swords, and equipment, and even part of a football stadium seat! Looking for military gifts? Listed below are a number of occasions for giving military gifts. We have matched some military gift-giving occasions with the custom framing services and products we offer. Contact us with your questions at 912-756-2781 or use our contact form. 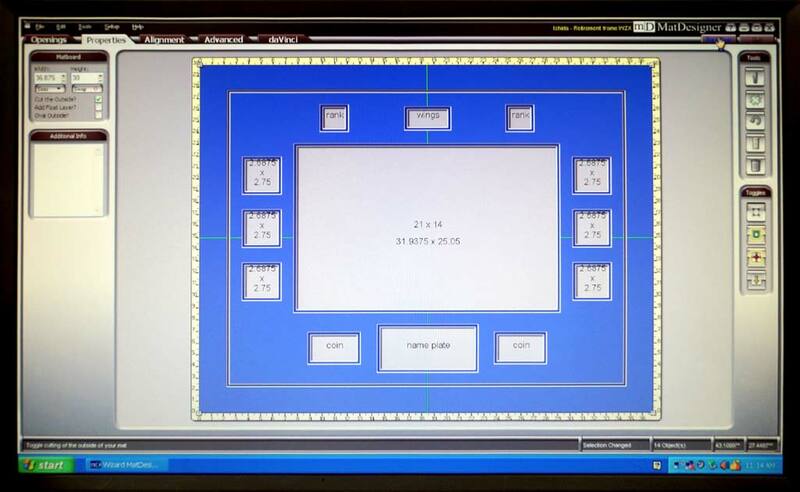 We look forward to providing you with custom frames for your projects.